I'm a pastor's wife, a Bible study leader of 25 years and a Bible study author. But, like everyone else, I need a little help now and then. About a year ago I saw a Christian therapist for about two months. She was wonderfully helpful. I considered asking her to be my new best friend, but I didn't want to creep her out. So I refrained. But, like a kind and attentive friend, Heather leaned in, listened to me, affirmed my feelings, sympathized with me and nodded compassionately. She didn't take sides. My friends took my side, of course. Bless their hearts. That's what friends do, right? But Heather had nothing to gain from just rooting for me. She wanted to help me, so she lent an impartial ear. She knows things. My therapist has been trained to listen for clues that would help get to the root of my issues. She talked with me about behavior patterns and the roots of our emotions and lots of other stuff that I'm clueless about. She kept me on track. Because my counselor didn't take my side, she also didn't let me get away with junk. That's good, because my friends did. (And I'm thankful, bless their hearts! We probably wouldn't be friends today if they hadn't!) But Heather, because she was a Christian therapist, insisted that I do yucky Christ-like stuff such as forgive and confess my bitterness and take my share of the blame and work on my end of the equation and not on the other person's end. Yeah, she was a bully like that. She gave me tools. She gave me sympathy and encouragement, but she didn't stop there. She equipped me to leave her office and put into practice some tangible skills that would help me deal with change, grieve appropriately, manage my emotions and move forward. I like tools. 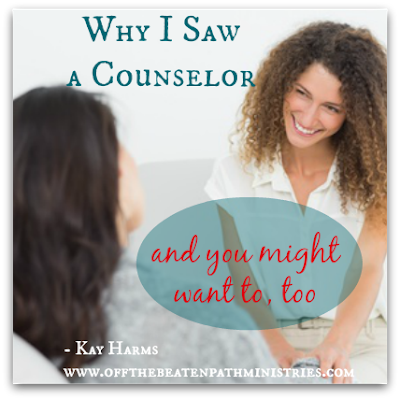 Were you wanting more of the nitty gritty about why I went to see a counselor? Well, actually I don't mind telling you that this wasn't the first time I've sought professional help. First I went to see a counselor about 25 years ago when my husband experienced a major medical trauma that left me with a little case of PTSD. In one day my husband had a major medical emergency and I gave birth to our first child. I was in shock. On top of dealing with post pregnancy hormones, I had to figure out how to navigate my new less-than-reliable normal. I tried to manage on my own for a while. Then I went to a counselor. Mostly he just listened and I purged. But that was more helpful than you can imagine. A number of years later I went to a counselor because my husband told me we were moving. And I didn't want to move. I drug my husband to see the counselor with me so that the counselor could tell my wayward husband not to move me. Refer back to bullet point number one. Counselors don't take sides. At least good ones don't. Mine was a good one. Oh well. And this past year I saw a counselor for about five sessions, I believe it was. A major and beloved relationship had changed drastically. I don't like change much anyhow (see the previous paragraph) and this change about knocked me down. No. It did knock me down. So I went to a counselor to get back on my feet so I could move forward. You might need to know that during this same time period, as well as before and after, I cried out to the Lord in enlongated quiet times and became more intimate with him than ever before. I filled several memory and meditation albums with applicable scriptures that fed my soul. I drew close to my husband and heeded his wise counsel. I reached out to friends and poured out my heart to them. I took long walks and listened to praise music. And I prayed and prayed and prayed. And I don't mind telling you that. Here's why. We all need a little extra help and a different kind of help now and again. Life deals us some hard blows. Maybe you've experienced a few? A child ends up in rehab, a husband walks out, a mother develops Alzheimer's, a dad dies too early, a child drowns, a friend gets cancer and dies, a marriage becomes empty, a sister walks away from her faith... Life hurts. And even if your circumstances aren't as "drastic" as the situations I've listed, dear friend, sometimes it's just the culmination of many ordeals or the timing of one or the season in which it hits us that causes us to struggle until we're exhausted. A good Christian counselor can breathe a little fresh air into what seems like a hopeless situation. She or he can speak truth to you without worrying about losing your friendship. They can see things from an objective vantage point, ask the right questions, insist that you be honest with yourself and give you a few new tools. Don't hesitate to seek wise, Christian counsel from a professional if you feel the need. In fact, if you feel the need you've probably already waited longer than you should have. Don't let negative or judgmental people stand in your way. You can feel better and cope with life better. Your situation is not hopeless and you are not beyond hope either. Those are lies from the enemy. Don't buy them. I got help. You can, too. PS. Just a few more things I need to say if you're still reading. Please seek biblical counsel. I suggest you ask your pastor for recommendations. Most pastors are equipped to handle one or two counseling sessions, but beyond that you're better off seeking a fulltime Christian therapist. My husband has a degree in psychology besides his graduate degrees in theology and ministry. But he tells me that's just enough education in human behavior to show him how little he knows about the field. Besides, most pastors have enough on their hands with sermon preparation, administration and shepherding their congregation. If you want a highly trained and practiced individual to give you biblical counsel, look for a therapist. If you're going through a difficult struggle, I encourage you to walk that struggle out in the pages of God's Word. 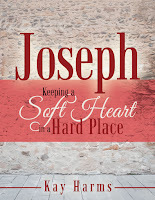 You can do that through my newest Bible study, Joseph - Keeping a Soft Heart in a Hard Place. More information here.